“Gentrification increases the quality of life policing specifically for the people who are gentrifying which are generally white, light, [and] able-bodied,” says Tasha Amezcua, Safe Outside the System Coordinator at the Audre Lorde Project. “Increased policing disrupts our safety [and] also increases our contact with the criminal justice system,” she says. Rachelle Erica Faroul, a Black Queer East Flatbush/Crown Heights native, who now lives in Philadelphia, experienced this first hand. During a recent visit to Central Brooklyn, Faroul had a run-in with new Brooklynites who threatened to call the police on her and her friends who were in the local public basketball court at Fulton and Classon Aves in Clinton Hill, a neighborhood where the white population more than doubled from 2000 to 2010, according to a study done by the Center for Urban Research. The new neighbors, who were moms with strollers, had a clear message, “move or we’ll call the police.” Rachelle and her friends spoke to the mothers, explaining that calling police would put them in danger. The mothers eventually moved along, but their impact was made. “[The women who asked us to move were] convinced that the police are paid to, and actually do protect citizens,” Faroul says. Faroul, however, experiences it differently. “I think the police are there to protect property,” she said. Ryann Holmes joined us on BK Live to discuss gentrification + the LGBTQ community of color. Click to watch. 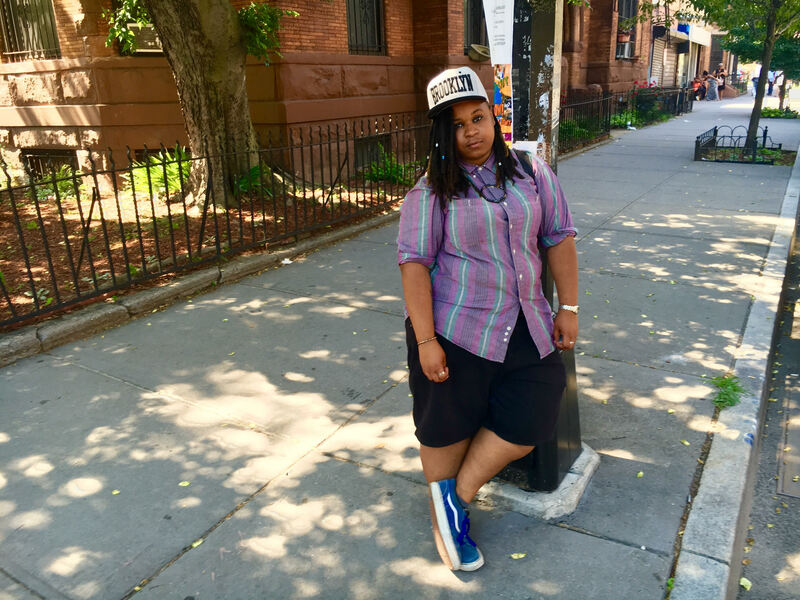 Ryann Holmes, co-founder of Bklyn Boihood, a Brooklyn-based collective that works to build community and healthy masculinity in the queer community, has been living in Brooklyn for a decade, ever since graduating college. Like Bell, Holmes moved into a black neighborhood because it’s reminiscent of the neighborhood where she’s from. But eventually, Holmes was priced out of her Bed- Stuy home. Holmes is seeing her queer community being broken apart and displaced. “As I moved, quite literally I’m watching white folks come in right behind me,” she says. Real estate is always at the heart of gentrification, but losing neighborhood space has had a particularly profound effect on LGBTQ cultural cohesion. In a recent Brooklyn Deep podcast, Ejeris Dixon, a social justice consultant, spoke about the Starlight Lounge, a black-owned queer bar in Crown Heights, a casualty gentrification. Dixon sites the space as a rare site of intergenerational dialogue for the LGBTPQPoC community. “It was a place where you could meet and hang out with people people and actually hear about the history,” says Dixon on the podcast. “What we have left is trying to be in solidarity with everybody else in the neighborhood while also trying to create safe [QTPoC] spaces in new ways,” she says. “It’s important that queerness or queer and trans identities, LGBTQ identities, get written into gentrifying stories,” said Tasha Amezcua. “We’re not gentrifiers and I think one thing that we often forget [is]that these systems are really good at is pitting us against each other,” she says.